On our way back from the airport after arriving in Miami we stopped at the Glaser Organic Farmers’ Market in Coconut Grove, where we go every Saturday to have our raw organic lunch and buy farm food for the week. It felt good to be back to my routine again! As much as I love Jamaican food I was really missing my raw dairy. I didn’t eat any dairy the entire time I was there because I couldn’t get any raw pastured dairy and I certainly wasn’t going to have the UHT milk that everyone drinks there (although it is supposedly from pastured cows but the UHT process denatures the protein and makes it an unhealthy drink). When we go to Glaser I always get the same thing: Nori roll, raw goat’s milk kefir and fresh local young coconut water straight from the coconut. I feel amazing after! The raw kefir takes away any sweet temptations because it is fermented, which balances out your body’s pH,¹ although if I am going to have something sweet, Glaser is the place to have it. They make delicious fruit pies that are sweetened with nothing else but fruit. Their ice cream on the other hand, is sweetened with agave and so are some of their snacks so you have to be careful and read the ingredients. The Nori wrap is made of mixed greens, grated carrots, cucumbers, tomatoes, avocado, their own cashew herb paste, sprouts, parsley, cilantro and scallions, all wrapped in a sheet of Nori and dipped into a herb vinaigrette. 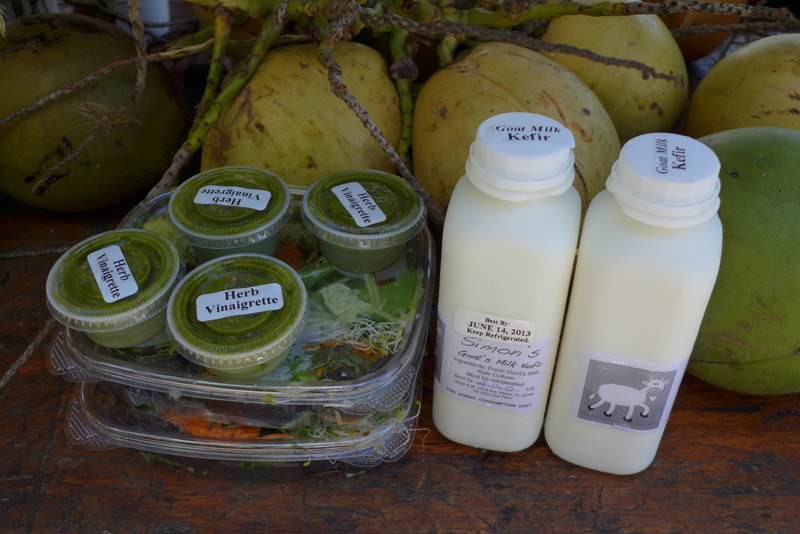 The raw goat’s milk kefir comes from Simon’s goat farm in Homestead. He also makes the best raw goat’s milk halloumi cheese and raw goat’s milk feta I have ever tasted and I usually stock up on it for the week. Glaser Organic Farmers’ market is one of the reasons I began to love living in Miami. It is where I got my first taste of all the unusual tropical fruits that grow here such as mamey, white and black sapote, acerola cherries, dragon fruit, egg fruit, jack fruit, monstera deliciosa and hall avocadoes. There used to be a fruit vendor called Tim who introduced us to a new fruit each week, our favourite being white sapote which unfortunately is only available one month of the year in June. It is also where I get my weekly local young coconuts from our Trinidadian friends ‘Kokonut Kreationz‘ (who we hired to serve coconuts at Olivia’s birthday party and were a huge hit). After Glaser we usually stop by Athens Juice Bar owned by the same Greek family since 1942, where we buy a half gallon bottle of fresh coconut milk (not water), made from pressed mature coconut, coconut water and chunks of coconut. It is heavenly and I have never seen fresh coconut milk sold anywhere else, so this is a real secret which more people should know about (the reason for this blog.). I have only ever seen coconut milk sold in cans and far from fresh, usually with preservatives and tainted with BPA from the lining of the can. The milk from Athens is lighter than regular coconut milk which is more like cream, because it is combined with the water. It is a good alternative to milk for those who are dairy free. I still find it surreal that after living in big cities my whole life, most of it in rainy and cold London, I now am living my dream of being in a tropical climate where coconuts grow; and I don’t think I can ever live in a temperate climate city again! 1. Gates D, Schatz L (2006). The Body Ecology Diet, 9th edn. B.E.D. Publications: Georgia, p.114.